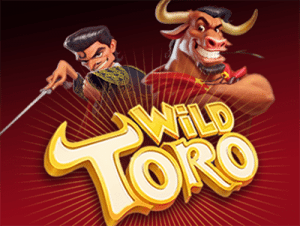 Wild Toro is a Spanish bullfighting themed pokies game from ELK Studios, full of bold colours and entertaining animation. We review the Wild Toro slot and explain where to play this exciting online pokies game for real money at the best instant-play pokies casinos on the Web. Wild Toro is a five-reel, four row video pokies game with a jackpot win of up to 225,000 coins and the unusual amount of 178 ways to win. In this intricately designed ELK Studio’s game, a sharply dressed matador takes to the reels to fight a powerful bull, but the bull has other plans… Wild Toro uses a beautiful old Spanish design and offers wild symbols, scatter symbols and ELK’s innovative Betting Strategies feature. If you’re familiar with ELK Studio’s hit pokies game Taco Brothers, you may recognise the matador character. Diaz Junior is the son of Captain Diaz, the evil villain who steals the villager’s tacos in Taco Brothers, and while Diaz Jr certainly shares his father’s sinister a look, he is nowhere near as wicked. The only thing which makes Diaz Jr malevolent is his love for bull fighting, but the charismatic bull certainly gives him a taste of his own medicine. Wild Toro, like all other ELK Studios games, is available in instant-play mode, which means you can play directly over your Web browser with no downloads needed. Wild Toro has also been optimised for mobile play, so you can play for real money on the go from your smartphone or tablet from anywhere you can secure an Internet connection. Wild Toro can be sampled at our recommended casinos for free in practice mode, or played for real money by signing up for an account and making a cash deposit using a trusted payment method like credit card, web wallet, pre-paid card or bank transfer. ELK pokies are a little different from your standard online pokies game, so if you’re used to playing games from software providers like NetEnt, Microgaming or QuickSpin, it might take you a few rounds to get the hang of things in Wild Toro. Instead of having the betting buttons at the bottom of the reels, you’ll need to click on the subtle coin button in the bottom left hand corner of the reels to select your bet. From here, click on the size of your bet (the minimum bet is $0.20 while the maximum is capped at $100) and then scroll right if you wish to activate one of the four Betting Strategy features for an additional cost. Walking Wild – The grinning Toro becomes a Walking Wild, where the symbol can move across the reels from left to right, generating one free re-spin for every step he takes. Note the Toro symbol only appears on the fifth reel. Matador Re-spin Challenge – A combination of three Matador symbols across a winning payline triggers the Re-Spin Challenge, awarding three free re-spins. During this bonus, the Matador symbols become sticky and the appearance of any new Matador will award an additional re-spin. 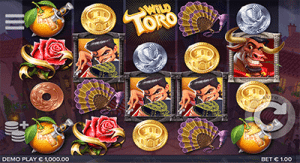 Toro Goes Wild Bonus Game – When the game is in bonus mode, the Toro will start charging across the reels to attack any Matador in sight, leaving wild symbols in his wake until all Matadors are defeated. The Matador shrieks in fear and does his best to hide behind his red curtain but to no avail, as the Toro moves both horizontally and vertically. While we’re not entirely sold on ELK’s Betting Strategies feature, it’s unquestionable Wild Toro presents a beautifully designed and engaging pokies game with plenty of winning potential. We love the funny animation behind the Matador and the Toro, and the introduction of the unusual 178 Ways format is testament to ELK Studio’s commitment to creativity and desire to try new things. Although it has nothing to do with how the game pans out, we love that a character with relation to Taco Brothers has been introduced – it’s the small details like this which makes ELK such a boutique game developer.